This 7-night cruise through the Rhone River Valley is just 129 miles from start to finish. Within this relatively short distance the scenery transitions from the verdant green French countryside of Lyon, Beaujolais and Tournon, to the more arid, Mediterranean hillsides of Provence, with the truly Roman cities of Avignon and Arles. The ancient Romans used the Rhone River as a nautical highway to conquer France, planting vineyards on the steep hillsides that produce that today produce the remarkable and highly prized wines of Cotes-du-Rhone, Condrieu, Cote-Rotie and Chateau-Neuf-du-Pape. Visit the UNESCO World Heritage sites of Pont du Gard and Palais des Papes in Avignon, the coliseum in Arles and historic wineries along the way. Rhone wine varietals and blends include Syrah, Grenache and Mourvedre. The cuisine here is marvelous and will not disappoint! Lyon is considered the gastronomic capital of France. Join your hosts Anna Marie and Deb on board the lovely AmaCello, sampling their best wines, paired with regional cuisine. Special events are planned along the way! Anna Marie dos Remedios began making wine in 2007, focusing on small lot, single-vineyard designated wines from some of California’s best wine grape growing regions. 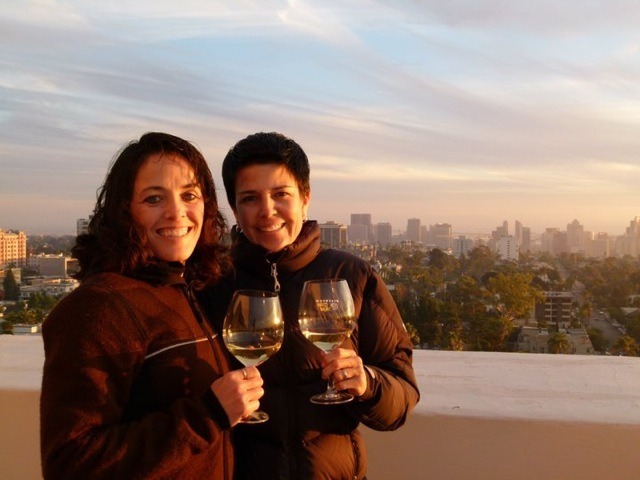 She studied at the prestigious UC Davis winemaking program to better understand the chemistry of wine and winemaking. Anna Marie and partner Deb Payne started Idle Hour Winery focusing on traditional methods, native yeast fermentation, gravity flow racking and use of neutral French Oak barrels. The result is an elegance and freshness which are the hallmarks of the smooth and subtle Idle Hour vintages. The winery is located in Oakhurst, just outside the south entrance to Yosemite National Park. The site is home to both the Idle Hour Winery and Queen’s Inn by the River, an 8 room boutique hotel with wine bar and beer garden. Idle Hour Winery opened a tasting room in Carmel Valley in the heart of Monterey County last year to promote their Santa Lucia Highlands Pinot Noirs as well. Idle Hour is named after a Chinese junk vessel once owned by Augustinho dos Remedios, Anna Marie’s paternal grandfather. She enjoyed sailing and fishing on that wonderful ship as a young child in Hong Kong. France’s beautiful Rhone River was used by the Romans as a nautical highway in their conquest of ancient Gaul. Along the way they planted the first vineyards, predecessors of the great Rhone wineries today. Join Anna Marie and Deb Payne on this sailing adventure down the Rhone, from Lyon to Arles, with optional package tours in Paris and Barcelona. Please note: This Rhone River Cruise 2019 (hosted by Idle Hour Winery) tour and cruise program is created by our tour operator, Expanding Horizons of Tustin, CA in conjunction with AmaWaterways. The pre and/or post cruise tour program may contain private meals, tours and/or visits to attractions. These additional services are exclusive to guests on this cruise who book their reservations with Expanding Horizons. Persons booking with alternative travel agencies will not be included in these activities.